The early medieval castle site was fortified with a moat and a rampart of clay and stones. The first walled building was the Church of Our Lady. Other churches, dedicated to St. George and St. Vitus, were founded in the first half of the 10th century. From the 10th century Prague Castle was not only the seat of the head of state, the princes and later kings, but also of the highest representative of church, the Prague bishop. The first convent in Bohemia was also founded in the grounds of Prague Castle, a convent next to the church of St. George for the order of Benedictine nuns. The period of the rule of King and later Emperor Charles IV. was a time of prosperity for Prague Castle, for then it first became an imperial residence, the seat of the ruler of the Holy Roman Empire. The royal palace was magnificently rebuilt and the fortifications strengthened. Building began on the Gothic Church of St. Vitus on the model of French cathedrals. Building continued on the Castle during the reign of Charles's son, Wenceslas IV. The Hussite wars and the following decades, when the Castle was not inhabited, caused the dilapidation of its buildings and fortifications. Until the 17th century Prague Castle was the residence and seat of the sovereigns, their court and the highest secular and ecclesiastic authorities. Twice in the course of its history it was the centre of a large Central European formation - the Holy Roman Empire. Later its importance declined for three whole centuries.After the origin of the Czechoslovak Republic in 1918 Prague Castle once again became the centre of the state. Nowadays it is the seat of the president of the Czech Republic and his office. The oldest and most important square in historic Prague dating from from the 12th cent. Its dominant feature is the Old Town Hall (prob. 1299) with its tower, oriel chapel (2nd half 14th cent.) and the Astronomical Clock (bef. 1410). Church of Our Lady before Tyn (Gothic, 14-15th cent. ), Tyn School (Gothic and Renaissance), House at the Stone Bell (Gothic), Golz-Kinsky Palace (Rococo), church of St. Nicholas (Baroque, K.I. Dientzenhofer), House At the Minute (Renaissance), Jan Hus monument (L. Saloun, 1915). The Old Town is the very centre of Prague. Many of the museums, markets, shops, restaurants and pubs are located in this area. Merchants and craftsmen began to settle here from the tenth century, but the citizens granted town status in 1338. The heart of the Old Town is the OLD TOWN SQUARE, Prague's showpiece main square and the most magnificent in central Europe. The square is surrounded by colourful houses of Romanesque or Gothic origin with fascinating house signs. One of the most striking buildings is the Old Town Hall, famous for its Astronomical Clock (Orloj), built in 1410. Every hour a crowd of spectators watch a mechanical performance by 12 Apostoles. The first stone houses grew up around the then busy market, free burghers built the first Prague town hall here, and here Charles IV. laid the basis for the impressive Church of 0ur Lady Before Tyn, executions and celebrations took place here, one of the last bombs of World War II. fell here. The coronation processions passed through here along the so called Royal Way, leading from the nearby Powder Tower, where the second royal palace stood on the site of the present secessionist Municipal House, around the Karolinum University across Charles Bridge to Prague Castle. Jews came to Prague probably as early as the tenth century. They settled in what is known today as the Little Quarter. In the Middle Ages there were two distinct Jewish communities. Jews from the east, from the Byzantine Empire, had settled around the Old Shul (side of today''s Spanish Synagogue), the Jews from the west around the Old-New Synagogue. These two settlements were later confined in an enclosed ghetto. For centuries the Jews were subjected to pogroms and persecution.At the end of 19th century the area of the ghetto, with its slums, malodorous backstreets and alleyways of the Jewish Town were replaced with luxurious five-storey mansions. However, the Town Hall, five synagogues and Old Jewish Cemetry were saved. All these "sights" are now run by the State Jewish Museum. It is Prague's most familiar monument.Charles Bridge was built by Bohemian king and Holy Roman Emperor Charles IV. in 1357 and for four hundred years was the only connection between the two halves of Prague.It is an impressive piece of medieval engineering, aligned between two Gothic gateways. Since its construction a wooden crucifix has stood on the bridge, swept off during the Hussite wars, than replaced by a bronze one. But the first sculpture wasn't added until 1683, when St. John of Nepomuk appeared. His statue was such a success that another 21 were added between 1698 and 1713, including work by Brokoff and Braun. Today 30 statues decorate the bridge. Despite just a few works being outstanding, set against Prague Castle, the effect is breathtaking. The 520 m - 1770 ft long, 10 m - 35 ft wide, 16 arches bridge connecting the 'Lower Town' with the 'Old Town', has served as a marketplace, a battlefield and an execution site. Today it is full of tourists, souvenir stalls and performers. The real place to enjoy Czech beer is a pub or beer hall (pivnice). Each pub is supplied by a single brewery (pvovar), so only one brand of beer is available, but several different types are on offer. The usual drink is draught light beer (svetle), but a number of beer halls, including U Fleku (see below) also serve special strong dark lagers (ask for tmave). A half litre of beer (just under a pint) is called a velke (large), and a third of a litre (larger than a half pint) is called a male (small). The waiters bring beers and snacks to your table and mark everything you eat and drink on a tab. In some pubs there is a tacit assumption that all the customers want to go on drinking until closing time, so don't be surprised if more beers arrive without your ordering them. If you don't want them, just say no. The bill is totted up when you leave. Not far from the bank of the river Vltava and the Troja Chateau, on land that had originally been a part of the chateau complex, on rocky ground stands the Prague Zoological Garden. Designed by J. Fuchs, it was opened in 1931 on an area of eight hectares. At first, it had 200 animals. At present, it covers an area of 45 hectares, has 12 kilometres of paths and a funicular. Though not the earliest institution of its kind in Europe, Prague Zoo has linked up with a tradition unmatched by other countries. Already the first kings of Bohemia, after they had made the lion a part of their coat-of-amus, thought it suitable to keep the majestic animal at Prague Castle. Rudolf II then added many other exotic animals to the castle's animal collection. Prague Zoo is one of Europe's largest and also nicest, because of its perfect location. It has a total of 1,960 animals, representing 360 species of mammals, birds and reptiles, 50 of them very rare. Prague Zoo has been associated particularly with the breeding of the Przewalski horse, its trademark animal. The horse can no longer be found in the wild and it is thanks to Prague Zoo that its breeding in zoos across the world has been coordinated since 1959. Sixty-five species are on the list of the European threatened species rescue programme. 750,000 people annually visit the Zoo. Its facilities include a restaurant, refreshments, playgrounds, etc.The Zoo is also accessible by pleasure boats, from piers at the Palacky Bridge and Rudolfinum, stopping at Stromovka. Charles IV. founded Prague's first botanical garden in the l4th century. This is a much later institution. The university garden was founded in the Smichov district in 1775, but in 1897 it was moved to its present site here in the New Town. The huge greenhouses date from 1938. Special botanical exhibitions and shows of exotic birds and tropical fish are often held here. One star attraction of the gardens is the giant water lily, Victoria cruziana, whose huge leaves can support a small child. During the summer it produces dozens of flowers which only survive for a day. This 318m (1043ft) hill is topped with a network of eight parks, comprising one of Prague's largest green spaces. It was once covered with vineyards and, before that, was a stone quarry with many of Prague's Romanesque and Gothic houses and churches built with the local stone. Charles VI. had new town walls erected along the ridge thus integrating the hill into the town. On the occasion of the Jubilee Exhibition in 1891, a scaled-down copy of the Eiffel Tower at the top of the hill and a funicular up the hill were added. The bottom station of the funicular is on Ujezd Street, from where it takes you 130 metres higher, travelling 511 meters up hill. The funicular has been intermittently in operation since July 25, 1891. Before the monastery of the Croatian Benedictines was founded here, this was a part of the Podskali district, served by the parish church of St. Cosmas and Damian. When the New Town was founded by Charles IV., Benedictines from the Balkans were invited to settle at the newly built monastery, practical Old Slavonic liturgy and create a centre of Slavic education and literature, in line with the wishes of the founder and thanks to a privilege granted by Pope Clement VI. A step cliff overlooking the river Vltava has been associated with the myth of the foundation of the Czech State and Prague itself. Legend has it that it was here the legendary founders of the Premyslid dynasty, Libuse and Premysl, resided, and where Libuse prophesied the town eternal glory "touching upon the stars". The medieval legend, revived at the Romantic period, has been confronted with a more sober scientific conclusion that while there are indeed traces of human settlement on this site dating from as early as 4000B.C., the medieval fortress of Vysehrad is actually younger then Prague Castle. This notwithstanding, while visiting Vysehrad and walking through the park decorated with statues by J. V. Myslbek on themes from old Bohemian legends, or admiring a view of the river and the city from the top of the cliff one is very likely to succumb to the illusion and believe the ancient legends. Impossible to get lost within the walls of the former fortress, wherever you go you are certain to find something of interest. Just behind the majestic Leopold Gate built in 1670 stands the Romanesque St. Martin's rotunda, the earliest preserved structure in Vysehrad. A very important architectural monument in Bohemia is the ancient monastery at Strahov. Covered by thick woods and brush, the hill above the Prague Valley was of no use to anything but wild animals for a long time. In the twelfth century monks cleared the hill and built a monastery made of wood. The monastery was commissioned by King Vladislav I of Bohemia in 1140. It was built on the highest point on the approach route to Prague Castle. Due to the need of an armed guard to protect the pilgrims and travellers going to the castle, this was an ideal place. When the building was completed it came to be known as the Venue of Diets. Foreign delegates and other important political figures were housed there on their way to Prague Castle. In 1258, a fire ravaged the building, and it was completely destroyed. The Villa Bertramka is the most significant Prague place connected with the name of one of the greatest world composers - Wolfgang Amadeus Mozart. A former vineyard manor house from the turn of the 17th century became in 1784 the property of the singer Josefina Duskova and the pianist, pedagogue and composer Frantisek Xaver Dusek. They, most probably, deserve credit for staging of Mozart’s operas Die Entfuehrung aus dem Serail and The Marriage of Figaro in Prague and for inviting the author to Prague. Here in the idyllic environment of Bertramka Mozart finished the score of Don Giovanni shortly before its memorable first night on October 29, 1787. At Bertramka Mozart also composed the concert aria Bella mia fiamma, addio and dedicated it to Mrs. Duskova. Mozart called his stays at Bertramka the most beautiful moments of his short and eventful life. In 1956 the Museum of Mozart and the Duseks was opened on the Bertramka premises, bearing witness to the history of the place and Mozart’s visits. All available memorabilia of W. A. Mozart and the Duseks, namely personal keepsakes, musical instruments, manuscripts, letters, period pictures, engravings, prints and other documents testifying to Mozart’s close relationship to Prague and to distinguished personalities of the then affluent Czech culture, have been gathered in this exhibition. The Prague Exhibition Grounds is situated in the northern part of the capital, in the area of the picturesque Troja basin. It occupies the eastern margin of the former Stromovka royal deer park, created already in the 14th century. The Exhibition Grounds were built for the General Land Centennial Exhibition held in Prague in 1891, which was a great social and cultural event. Many important personalities of the time were involved in its preparation. The Exhibition Grounds have a rich history that reflects the historical and social development of Prague, as well as of the whole of the Czech Republic. One of the most famous Prague's tourist attractions in Lesser Town. This church, built in the period 1703-61, is the most significant historical structure of the so-called Prague Baroque. The architects were G. Santini, K. I. Dienzenhofer, and A. Lurago. History: There has been a church on this site since the 12th century. It was the Old Town's parish church until Tyn church was completed in the 14th century. The church that stands there today by Kilian Ignaz Dientzenhofer was completed in 1735 and is the most significant historical structure of the Prague Baroque. 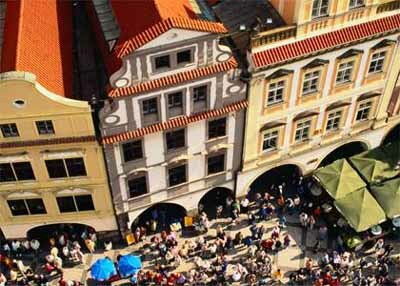 Hradcany, the residential area around the west gate of Prague Castle, was made a town in its own right in 1320. Before it became a borough of Prague in 1598 it suffered heavy damage in the Hussite wars, and in the Great Fire of 1541. Nevertheless, the area is an outdoor museum of well-kept antiquities. Malá Strana (the Small Quarter) clusters around the foot of Prague Castle. Most visitors pass through on steep Royal Way, as they climb to the castle, but the narrow side streets of this baroque quarter are worth examining. Almost too picturesque for its own good, the district is now a favourite for movie and commercial sets.